With just 4 months training, you can earn a Certificate in Air Conditioning, Heating, and Refrigeration! NTI’s HVAC technician training program is recognized by the industry, offers affordable tuition, and flexible morning or night classes. 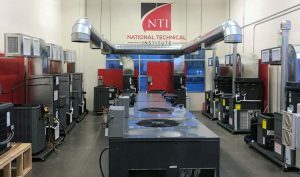 If you’re starting from scratch or already have HVAC repair experience, NTI’s training programs are the right choice for you. Our program includes EPA 608 Universal Certification Exam and preparation. Want to get done faster? Contact NTI now and ask about our special 3-month schedules! The HVAC/R technical profession is one of the fasted growing careers in the country. Highly skilled technicians are in high demand, and as buildings become more energy efficient, trained HVAC/R professionals have become essential to the successful operation of these facilities. National Technical Institute can help you enter this exciting profession, and put you on the path to a successful career as a skilled HVAC technician. Includes EPA Certification Seminar & Exam! Get hands-on advanced training with great instructors. Expand your skills by adding refrigeration. Expand to commercial and large facility systems. We have a 9,000 square foot training facility that is dedicated to technical training. Our classrooms have state of the art audio/video equipment and computerized teaching aids. Our 3,000+ square foot lab is a fully equipped, professional atmosphere with 3 phase power and electrical training units available to practice control wiring and circuit troubleshooting. Students reinforce classroom instruction with “hands on” training using industrial and commercial equipment as well as A/C, gas heating units and refrigeration equipment, including ice machines, reach-in coolers and basic refrigerators. Do you envision a career as an HVAC specialist? You first need to get your EPA certification from one of the best HVAC schools in Las Vegas and your learning needs to include hands-on training rather than just theory from powerpoints. Learn from one of the best trade schools in Nevada and become an HVAC specialist. Be contractor-ready when you complete your training with us as we are one of the best HVAC schools in Las Vegas. Be sure to check out our reviews online. A faculty of industry experts ensures you get the most practical hands-on training in a real-world state of the art lab. Is vocational school right for you? Watch this video to learn the facts.